This is going to be the last week of the season that we take a look at survivor pools. And it has gotten to the point where it is very tough for people who are still alive to come up with a pick that works. It wouldn't be that way, of course, if you could pick any team you wanted. But since we can only pick any given team once during the season, we have some real challenges. There are four teams this week that feel like virtual locks - or as close to that as we get in the league these days. Pittsburgh is going to beat Brett Hundley and the Packers. Philadelphia will beat up on the Bears. Jay Cutler and his Dolphins will be no match for the Patriots. And Seattle should beat San Francisco - though that result isn't as confident as the first three. Frankly, though, if you are still able to pick any of those teams at this point in your survivor pool then you are doing it wrong. So, we are left to pick games that aren't nearly as straightforward. We have to gamble, in other words - likely at a point when you are close to winning it all in your pool. Here, then, are the spots that could be worth gambling on. Good luck! Washington vs. New York Giants: The Giants beat the Chiefs last week. It's not as impressive as it sounds, though - Kansas City is self-destructing, it was only an overtime win, and the offense was still underwhelming. I don't have any issues discounting the performance. Washington, on the other hand, gets much more respect even though they lost last week. They only fell in overtime to a red-hot New Orleans team. Washington scored at least a touchdown in each quarter, Kirk Cousins was strong, they ran the ball effectively, and were generally solid. Washington is only 4-6, but they are better than they would expect a team with that record to be. New York is every bit as good as you would expect a 2-8 team to be. The Redskins probably don't have any postseason future or anything to play for left, but they haven't given up yet, and they have been more competent in almost any way than their opponent here. The Giants have not yet won a game against an NFC opponent - and they have had seven tries to do so. They aren't going to change that now, and that makes Washington a comfortable pick - and a team that you probably haven't found a reason to pick up to this point. Safe AND available - just what you are looking for at this point in the season. Baltimore vs. Houston: Houston won last week, but it was only against an Arizona team that seems to be entirely without a clue, so it only barely counts. Before that they had lost three straight. The thing their performances have in common lately is the totally useless QB play from Tom Savage. He is just not an NFL quarterback, and his team knows it. Baltimore isn't exactly getting great quarterbacking this year, either, but their defense is really strong right now, and it has them in an unlikely playoff position at this point. Houston has not been good on the road, and they are going to struggle to score against this defense. I'd prefer Washington if available, but at this point in the season you could do worse than Baltimore, too. Jacksonville at Arizona: It wasn't too long ago that Arizona had a genius coach and was a dangerous, overachieving team that people liked. Now they are just sad. They look old. They look disinterested. They look confused. They don't have a viable quarterback situation right now. They just look like a team that is desperate for the offseason. And it's going to be a rough offseason, too - they are going to make a lot of changes, and all the players know it. 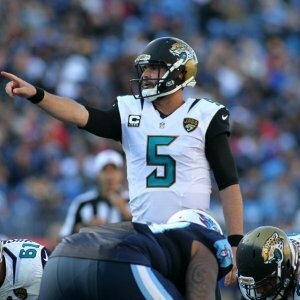 Jacksonville has allowed the fewest points in the league - a full field goal per game less than anyone else. They have won four straight and are feeling very confident. They have issues with injuries, but they still have enough going on to win this game. Blaine Gabbert is not going to be able to score against this Jacksonville defense, and that will make all the difference. Jacksonville is my favorite pick on the board this week.